Catholic Mass tonight at Neu Chapel! All are welcome to join us for Wednesday night Mass tonight at 9:30 p.m., in Neu Chapel. Father Christian Raab from St. Meinrad Archabbey will be here to celebrate Mass with us for the feast day of St. Angela Merici. Confessions will also be available beginning at 9:00 p.m. We hope to see you there! Please call/text Kristel at 812-760-8610 for more information. WUEV spring DJ call out meeting is today! Do you or a friend have any interest in gaining experience in being on air, in being a DJ, or want to know more about the radio field? If so you may be interested in attending the WUEV call out meeting on January 27, 4:00 p.m., outside Hinton Studio, on the second floor of Ridgway University Center. Thank you to all who came to the presentation on Syria last week. This week’s presentation will be on Venezuela, and Patricia will be presenting. Her major is literature, and she loves listening to music and reading. Her favorite part about UE is learning from different cultures. So come join us at 7:00 p.m. on Wednesday night, upstairs in Ridgway University Center for a fun-filled presentation about Venezuela! The faculty scholarship display is happening now! Stop by the library to see what your colleagues have been up to. The display runs until January 30. A reception to honor faculty scholars will take place during Fridays @ Five: Friday, January 29, from 4:30 – 7:00 p.m. at the Melvin Peterson Gallery. Hope to see you there! Eighty-five percent of UE students report getting consent every time. Let's get to 100 percent! Stop by the Ridgway University Center lobby from 11:00 a.m. - 2:00 p.m., Thursday, January 28, and get your picture taken in your “It's On Us” T-shirt and pledge to get consent every time. Don't have a shirt? No problem ... We have plenty to give away! Other giveaways will be available along with a chance to have your voice heard through social media. Starting February 1, students of all levels of Spanish are invited to meet on Mondays at 5:00 p.m. at Jazzman's in Ridgway University Center to practice Spanish in a relaxed atmosphere with Fulbright foreign language teaching assistants from Venezuela and Argentina. Celebrate Black History Month with "The Movement: 50 Years of Love and Struggle"
The UE community is invited to celebrate Black History Month by attending the theatrical production of The Movement: 50 Years of Love and Struggle on February 1, 7:00 p.m., Eykamp Hall, Room 251, Ridgway University Center. This production features Emmy Award winning actor Ron Jones playing multiple characters, taking the audience through a multifaceted journey through the ever-changing face of the African American experience. The production will feature interactive video, stock historical footage, quotes, and some of the most memorable music of the last two generations. The performance will be followed up by an open discussion with the audience about the content of the show. The hope is that the performance will engage people in a discussion about culture, politics, and policy. For more information please contact LaNeeca Williams at lw161@evansville.edu or ext. 2413. This event is sponsored by the Office of Diversity Initiatives and the UE Anti-Bias Team. Interested in access to the 130 employers expected at the upcoming Collegiate Career Expo? This free career fair is scheduled for Thursday, February 18, 10:00 a.m. - 3:00 p.m. (Eastern time) at the Downtown Indianapolis Marriott. The University of Evansville will provide bus transportation. A $10 required deposit is refundable upon attendance. Reserve your seat now (www.evansville.edu/careercenter/busReservationForm.cfm). Fair registration is through UE JobLink (evansville-csm.symplicity.com/). Click the Jobs Tab -> CSM Jobs -> Posting #722252. Find a list of registered employers here: cccc-in.org/event-2060555. Today’s action item is to go to I-House today and learn about another country. "I have a dream that my four little children will one day live in a nation where they will not be judged by the color of their skin, but by the content of their character." ~ Martin Luther King Jr. There will be free HIV testing on Wednesday, January 27, at the Health Center. Please call 812-488-2033 to make an appointment. Last chance for Nerd Wars! Registration deadline is today! The Honors Program is hosting Nerd Wars trivia night on Tuesday, February 16, at 7:00 p.m. in Eykamp Hall, Ridgway University Center. Teams of five, consisting of students, faculty, administrators, and staff, will battle in a competition of wits while enjoying pizza, popcorn, and soda. The winning student team and the winning faculty/administrator/staff team will receive $25 MasterCard/VISA gift cards. Registration materials can be picked up in the Powell Honors Lounge, from Jayme Williams in Room 238, Koch Center of Science and Engineering, or can be done online by clicking here. The registration deadline is today, January 27. Any questions can be e-mailed to Stephen at sl192@evansville.edu or Paige at ph89@evansville.edu. Looking for a job? Need some extra cash? There are jobs available through federal work-study offered by the Office of Financial Aid for UE students. Eligibility is based on federal need as shown through the FAFSA. You can find the application here. Applications may also be obtained at the UE Office of Financial Aid in Room 116, Olmsted Administration Hall. Questions regarding eligibility and job availability should be directed to Catherine Carver at cc204@evansville.edu. 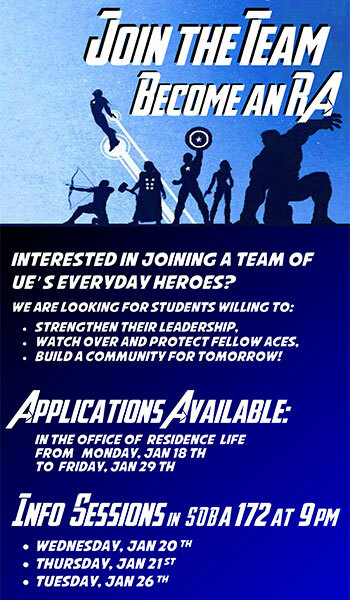 Applications to join the team and become an RA are due this Friday, January 29, at 5:00 p.m., in the Office of Residence Life! If you have not yet picked up an application to become an RA for the Fall 2016 or Spring 2017 semesters, they are available in the Office of Residence Life and online. Contact Betsy Whited at ew156@evansville.edu with any questions you have!